22 January 2008: Park Wan-su was born in 1955, into a poor farming family. After finishing technical high school, he studied at Kyungnam university during the night while working at a factory in the daytime. He passed the Higher Civil Service Examination held by the Korean government and worked in the Korean government for over 20 years. He also received a PhD in public administration from Kyungnam university and published several books including 'Society With Principle and Society With Hope'. Besides his civil servant career, he was a professor and the dean of government school of Kaya university. 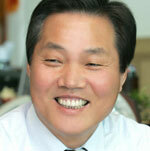 Mr. Park became the third elected mayor of Changwon at by-elections in June 2004. He was elected to a full term in May 2006. The mayor has been short-listed for the 2008 World Mayor Award and elected as a member of UCLG (United Cities and Local Governments) World Council in October 2007. Mayor Park doesn't seek fame and popularity, but instead, fame and popularity find him as he works earnestly from the bottom of his heart. He has been increasing the productivity and the efficiency of business in Changwon and is regarded as a CEO-type leader. Being a creative man, he has proposed lots of ideas to improve urban living. His two key plans are 'We love our companies' campaign and 'Creating an environmental capital of Korea'. 'We love our companies' campaign has resulted in an increasing number of jobs and companies in Changwon. The city is home to many multinational companies like GM, Volvo, Philips, etc. As far as 'Creating an environmental capital of Korea' is concerned, Changwon is to hold 2008 RAMSAR Convention. For this event, Changwon is geared to proceed with three major projects. The first one is to restore streams to an environmental-friendly city where every citizen can enjoy nature and a high quality of living. The second is to boost cycling as a method of transportation, which would improve the air quality and reduce traffic. The third is to make Changwon a solar city, which means utilizing solar energy in ordinary lives and saving fossil energy. Together wish Canberra of Australia, Brasilia of Brazil and New Delhi of India, Changwon is one of the best-know planned cities in the world. It is located in the southeastern area of the Korean peninsula and one of the best cities in Korea in terms of industrial and environmental environment. Since the Korean government designated Changwon as an industrial development area in the 1970's, Changwon has developed heavy industry and is a renowned city for the massive mechanical engineering complex. Since Mr Park became mayor of Changwon, the city has been named ‘best welfare city’, ‘best environmentally-friendly city’, ‘city with the best industrial policy, in addition to being named 'the best city to live in Korea' three years in a row from 2005 to 2007. The City Mayors Foundation has closed the nomination round for the 2012 World Mayor Prize. The Prize is awarded every two years to a mayor who has made outstanding contributions to his / her community and has developed a vision for urban living and working that is relevant to towns and cities across the world. Nominations were accepted until 17 May 2012. A shortlist of candidates will be published on 18 June 2012. The winner of the 2012 World Mayor Prize and other results of the World Mayor Project will be announced in early December 2012. The City Mayors Foundation, the international think tank on urban affairs, organises the World Mayor Project and awards the World Mayor Prize. The Prize, which has been given since 2004, honours mayors with the vision, passion and skills to make their cities incredible places to live in, work in and visit. The World Mayor Project aims to show what outstanding mayors can achieve and raise their profiles nationally and internationally.